A dental implant is a titanium artificial tooth root that the doctor places into your jaw to hold a replacement tooth or bridge. Dental implants are an ideal option for people in good general oral health who have lost a tooth or teeth due to periodontal disease, an injury, or some other reason. Dental implants are designed to provide a foundation to replace missing teeth with new "implant supported" teeth. Perhaps you have seen someone whose face and cheeks have a "sunken" appearance, likely due to tooth loss and the wearing of dentures. With dental implants, your facial contours will be preserved or restored. Periodontal implants are so natural-looking and feeling; you may forget you ever lost a tooth. You know that your confidence about your teeth affects how you feel about yourself, both personally and professionally. Perhaps you hide your smile because of spaces from missing teeth. Maybe your dentures don't feel secure. Perhaps you have difficulty chewing. If you are missing one or more teeth and would like to smile, speak and eat again with comfort and confidence, there is good news! Dental implants are teeth that can look and feel just like your own! Under proper conditions, such as placement by a periodontist and diligent patient maintenance, implants can last a lifetime. Long-term studies continue to show improving success rates for implants. Dental implants have been in use for over 30 years, with a predictable success rate over 95%. Many patients are concerned because they want dental implants, but do not know if they are a good candidate for implants. We first ask that you undergo a special dental radiographic examination to be used along with your standard dental radiographs. These three dimensional x-rays can be taken in a radiology office, or in a mobile van that will come to a location of your convenience. We use a highly sophisticated imaging program called Simplant. Simplant allows us to analyze CAT scan data directly on the computer and simulate implant placement. This sophisticated technology allows us to determine your body's ability to support a dental implant before any treatment takes place. We can analyze bone density and volume very accurately. We then can take this information and review this with your general dentist when formulating our treatment plan. Being able to tilt the implant images in 3 dimensions allows your dentist to have restorative ease and assures you many years of comfort and function from your dental implants. Dental implants can be placed under local anesthesia (dental Novocain) so you can drive yourself to and from the appointment. There is minimal discomfort after this dental implant procedure. The implant is placed through a gentle surgical procedure and left undisturbed for a period of 3 months so that your jawbone can bond with the implant(s). Temporary replacement teeth can be used in this phase. Permanent replacement teeth will eventually be attached to the implants. 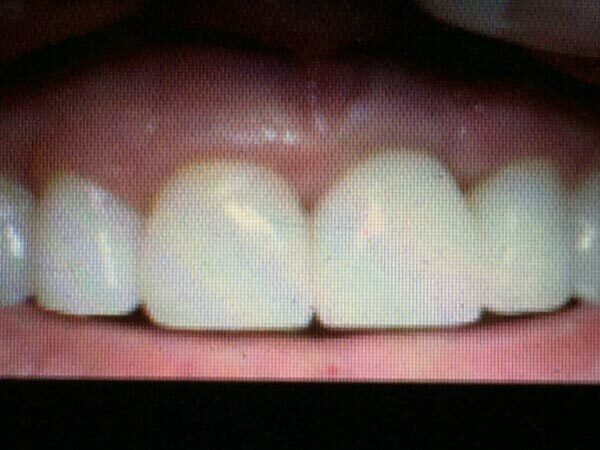 Can you tell which of these 4 "teeth" is an implant? 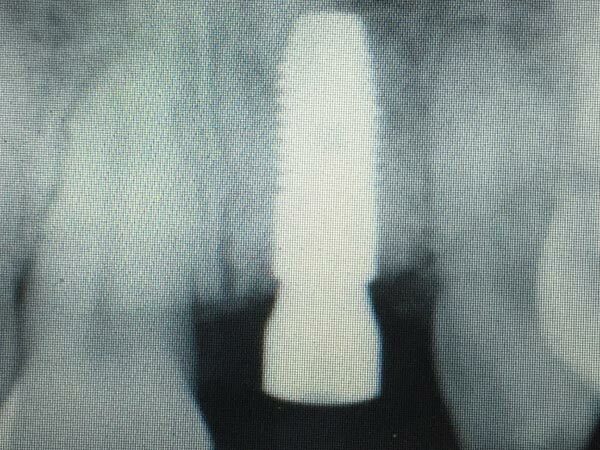 Implant is central incisor on right side of image. Replace one or more teeth without affecting bordering teeth. Contact us today for a dental implant consultation to restore your dentition and smile. We proudly serve patients in Manalapan, NJ, and the surrounding communities throughout Central New Jersey.